What Type of Wood Should I Choose For My Deck? A decking is a fantastic addition to any home. No matter how big or small your outdoor area is, a deck will give you a whole new space to enjoy. By adding to your home, you’ll revolutionise the way you interact with it; you don’t have to spend sunny days cooped up inside, now you can enjoy drinks, BBQs and time with friends and family on your deck. The decision to get a deck is an easy one, but when it comes to selecting the material, that’s where it gets a little more tricky. Will the deck be permanent, or can you imagine upgrading it in the near future? Are you looking for something that will be durable and weather-resistant? Are you looking for a sustainable option? Are you looking for something that is low-maintenance? Once you’ve answered those questions, read below to see which materials work for you. Treated pine is a popular option because it delivers on a number of fronts. Firstly, it’s a ‘green’ option because it is grown in plantations instead of being taken out of forests. Secondly, it’s cost-effective and thirdly, its durable, because it is treated against rot and decay. It is also a beautiful looking timber, with natural hues and grains that look amazing for years. Composite decking is a composite form of timber, which includes recycled plastic products. This means that it is a sustainable choice, and because it is coloured during the manufacturing process, it requires little to no maintenance. Once it is set, it will look the same for decades, with no painting or staining needed. The plastic makes the decking resistant to mildew and insects. The planks are available in a range of colours, meaning they suit any aesthetic or style. Blackbutt is a beautiful hardwood. It is a plantation species, grown in New South Wales and Queensland, so it is sustainable, and its natural colours make it a popular choice for a range of carpentry applications. It will need to be treated once a year, to maintain its tone and prevent rot and moisture damage. Cumaru is one of the most natural beautiful hardwoods available. It has a dark brown colour that has hints of purple and red. On top of its natural beauty, it is also extremely hardy and resistant to rot. It is not an endangered species, so it is an eco-conscious choice. It can be tricky to work with, so it’s always best to get a decking specialist, rather than go down the DIY-route. Spotted gum is a fantastic choice for a deck, mainly due to the natural hues and colours that it comes in. You can find planks ranging from dark chocolate to light golden brown, and the wavy grains make it an endlessly appealing timber to look at. It also has a lifespan of 40-years, meaning that with annual maintenance, your initial investment will last for decades. It is a native timber, so it is fire-resistant, making it the ideal choice for anyone living in a heavily-wooded or fire-prone area. Merbau is perhaps the most famous of all hardwoods when it comes to decking. Its beautiful aesthetics come from its natural oils, which also make it incredibly durable and resistant to splitting. It will need to be stained once a year to maintain its appearance, but you can expect it to last a very long time. Whatever wood you opt for, you need to understand the importance of how it is laid and how it prepared. No matter how strong a material it is, an improper frame, the use of the wrong fixing materials and the wrong stain will all lead to your deck needing to be replaced far beyond its time. Your deck will become a central part of your home, and during the summer months, it might be the most trafficked area. It’s worth spending the extra money to have it constructed by a professional. The other advantage of contacting a professional is they can pass on high-quality wood and products at lower costs than you can attract in hardware stores. 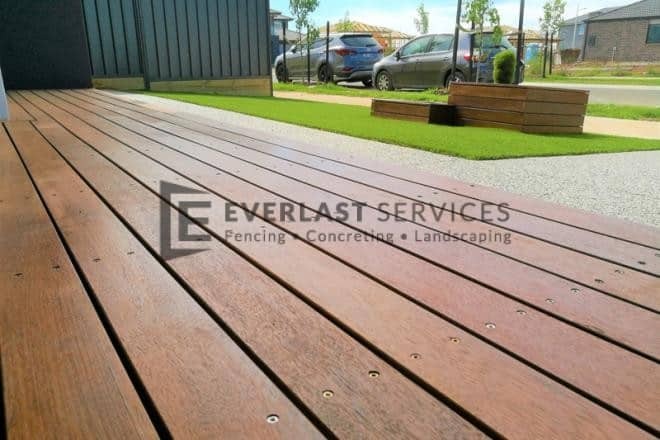 If you’re struggling to choose the material for your deck, or you would like to get an idea of how much your project will cost to build, get in touch with Everlast Services for a free home visit and quote.